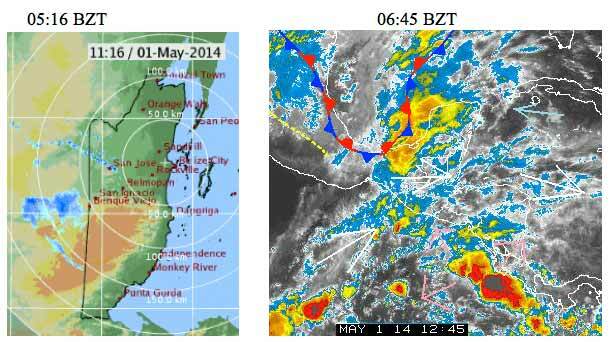 Belize NMS: Warm and relatively unstable conditions will continue the next few days. 24-hour forecast: Mostly sunny, hot and hazy today and partly cloudy skies tonight and mostly sunny, hot and hazy conditions tomorrow. Isolated thunderstorms will develop mostly in the south tonight and inland tomorrow afternoon. Winds: East - southeast 10-20 knots with occasional higher gusts. Today: Winds: E/SE 10-20 kts. With occasional higher gusts; seas: Moderate - rough; waves: 4-6 ft.; little or no rainfall. Tomorrow: Winds: E/SE 5-15 kts. ; seas: Choppy; waves: 2-4 ft.; little or no rainfall. Marine Outlook: Friday night:- Winds: E/NE 5-15 kts; seas: Light chop- choppy; waves: 1-3 ft.; isolated thunderstorms in the south. General Outlook: Through to Saturday morning: Generally cloudy with a few showers and isolated thunderstorms mainly inland. On Ambergris Caye this morning the wind continues. The sea is rough and we have heavy overcast. Hoping for rain. That rain never materialised. . . . .There were few isolated patches of significant rain, but very localised, such as Teakettle but not south Teakettle. That rain on the Radar was only like that for less than half an hour before it faded out. There is a lot of very high activity around, but I still don't see rain for Belize.. . .. Yet an hour ago, we still had heavy, dark Overcast clouds. Right now, the clouds are thinning, some blue sky and some Sun shining through, the wind is suddenly picking, which indicates there is rain not far away. The Radar at 7:45 showing a few very small spots of rain, between Belize City and Belmopan. There was a significant short period of heavy rain in West Belmopan in the early hours. There was a good downpour in Springfield (S. BMP) around midnight, and then a shower around dawn. The grass is greening up and the dust is gone for the moment. We need serious rain soonest.